JAPAN: Drive your home entertainment system from anywhere in the world with iRemocon | What Hi-Fi? Products to turn your smartphone into controls for all sorts of things are all the go at the moment: not only can you turn it into a home remote with the likes of ThinkFlood's RedEye or Gear4's UnityRemote, it can also become a security device for your car, monitor the state of your Nissan Leaf's battery (or even start up the heater on a cold morning before you leave the house), and much more. Newly-launched in Japan is a package taking things one stage further: the iRemocon, from a company called Glamo, Inc., is designed to work with a range of smartphones, including both Android and iOS platforms. 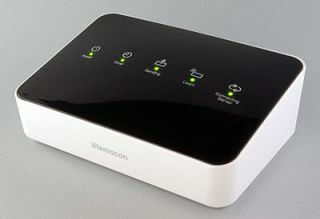 The system – 'remocon' is the common Japanese term for a remote control – comprises a box connected to your home network router via Ethernet, and combining a preinstalled base of remote control codes and the ability to learn those it doesn't already have onboard. Built-in high-power wide-angle infrared senders (or optional wired IR flashers) then rebroadcast the signals under the control of a free, and very customisable, app downloaded from either the Android Marketplace or the iTunes store, and that's about it – job done, and yours for Y25,000, or about £200. Except… The system also lets you program it to perform a series of commands under timer control, and best of all allows you to control your system from anywhere you have a phone signal. So if you travel a lot, and you've always wondered why you can't startle the folks back home by firing up an episode of Come Dine With Me when they're least expecting it, now you know how.